XOXO Jes - Canadian Entertainment News: Larry King is going to Banff! Larry King is going to Banff! 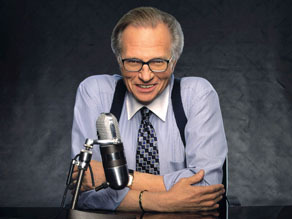 Larry King will be receiving the Lifetime Achievement Awards at the Banff World Media Festival in June. Lifetime is right. I may make the trek out to Banff this year...just so I can attempt to snap Larry's suspenders. Dammit...I am probably going to be banned now, oh well. Larry, you have been warned.